Washington County has initiated a planning process to rethink the structure and support system for its ongoing, long-term community participation program. The impetus for this planning process began with a fall 2014 announcement by the service provider that had supported the county’s Citizen Participation Organizations (CPOs) and the Committee for Citizen Involvement (CCI) for several decades, Oregon State University Extension, that it would no longer continue this role effective fall 2015. The planning process has since evolved into an opportunity to take a thorough look at the program and plan a system of engagement for the 21st century. 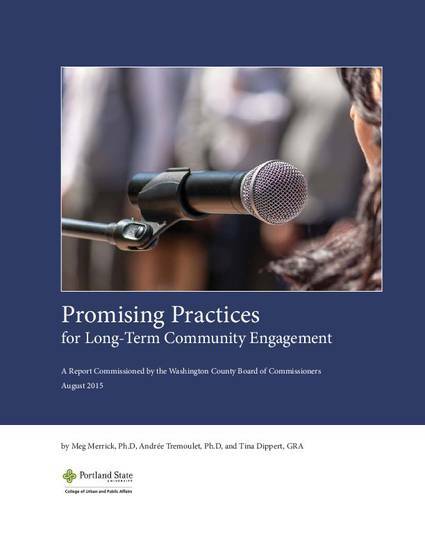 Washington County contracted with Portland State University to conduct background research on best/promising practices for county-level public involvement models and prepare a report that includes an overview of best practices, a selection of best practices profiles that are most relevant to Washington County’s needs, and a series of recommendations based on these findings. The results of our work are transmitted and presented in the pages that follow. It is hoped that this information will be a valuable resource to the Transition Team, elected officials and staff, and that it will stimulate imagination and expand the options considered in the planning process.